The year was 1929. 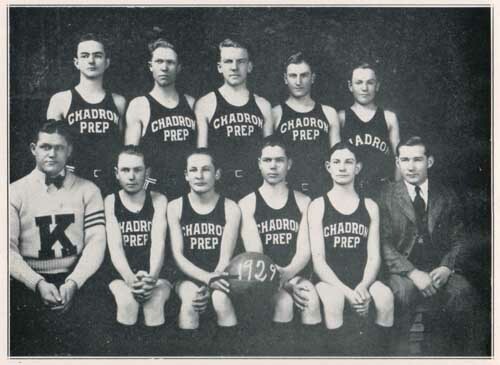 We've read that Prep had no athletic teams in 1926, 1927, and 1928. But in 1929 these fellows suited up to play basketball for Coach Leo Stangle. While the faces aren't familiar, a few of the family names are. Standing (l-to-r) are: John Coffee, Lester Lundy, Captain Joe Schwieger, Frank Wolf, and Lyle Collons. Seated are: Manager Art Stark, Harold Brecht, Russell Douglass, Orin Hunt, Garrett Hunter, and Coach Stangle. We wonder if Art Stark was related to "Chuck" Stark, who worked for the Consumer's Public Power District in the 1950s? Perhaps his father, uncle, or brother?